As we all know Light Emitting Diodes(LED’s), are used in a wide range of applicationsÂ like indicators, long-lasting source of illumination in sensors, home and also industrial applications. They are known for their less heat dissipation and also as an electricity saver. If our usual bulbs like incandescent and fluorescent bulbsÂ are to be replaced by LED’s the latter must be more larger as well as powerful than the former. But for this, the heat dissipated by the LED (though very little compared to other devices), must be completely removed. The other types of bulbs use more electricity and also dissipate more heat than a LED. So, if we can replace them with an LED, it will help in saving a lot of electricity. From the name itself we understand that LED is a semiconductor diode that converts electricity into light. 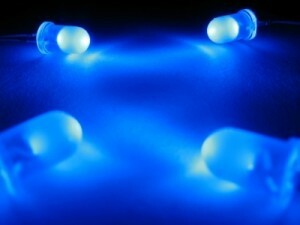 The heat from the LED cannot be removed through conventional ways. This is because it does not emit heat as infrared radiations. So, either conduction or convection methods have to be used to remove the heat. Conduction is the method of transferring heat from one place to another. Convection is the expansion of a liquid or gas due to the rise in temperature. If an LED system is used in a high power application without removing the heat, it causes in reducing the lifetime of the device as well as dimming of the light. The basic ways to reduce the heat is to make a conducting metal like aluminium or copper to act as a heat sink by placing it near the device. Another method is to build a fan near the device so that it dissipates the warm air from the system. The third and most effective way is called the “Air Bullet Method”. This method is more effective than the other methods. An oscillating diaphragm is used to pump jets of air over the heat so that they are driven away. For this method, a synthetic jet technology called SynJet is used, for which nozzles are placed very near to the heat sink. The nozzle blows air when it is pumped with the help of the up and down motion of a diaphragm which is driven by an external voltage. When the diaphragm moves up and down, a bullet of air is created with each movement. Since this flow of air is more thermally efficient, lesser air is needed to remove the heat and also lesser noise is produced than a fan. This method is a little more costlier than the other methods, but is more reliable than any other method. This method will work with any standard heat sink and its performance will not decay over time.